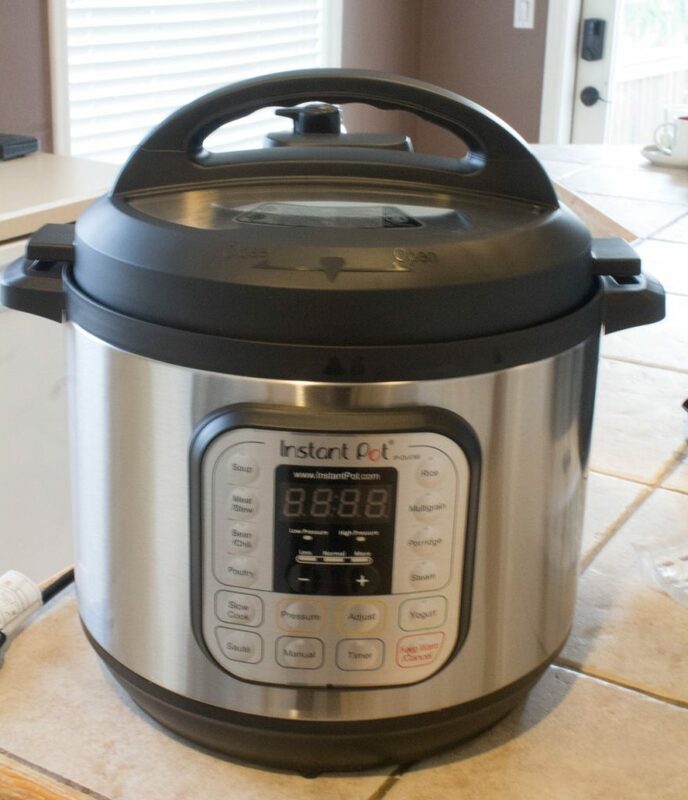 I ended up biting the bullet and buying an 8 Quart Instant Pot about a week and a half ago (specifically, this model on Amazon, which was on sale recently). As I know many others may be thinking of purchasing one, I thought I’d share my experiences so far. First, you should know that I’ve never previously owned or cooked with a pressure cooker. The idea did sound a bit intimidating, but I’d read so many positive reviews and seen so many delicious recipes, I decided to go for it. 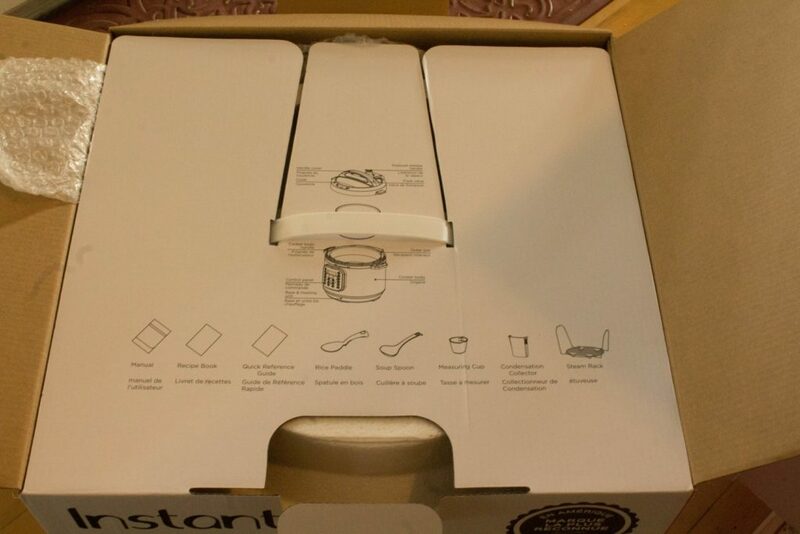 Here’s what my Instant Pot looked like, once out of the Amazon box. 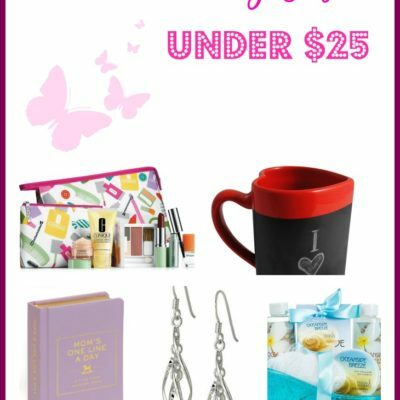 When you open the lid, you see an itemized list of everything that’s contained inside. 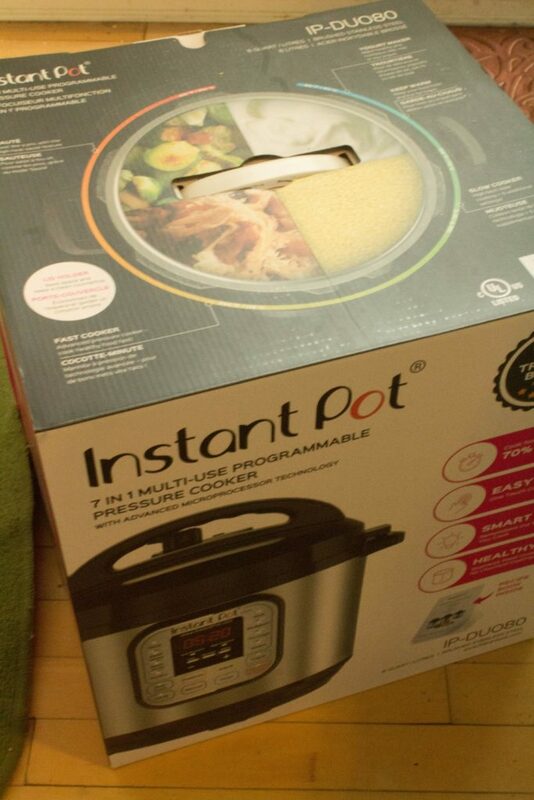 Here is my Instant Pot. I have to admit, I had a mixed reaction when I pulled it out. Yes, I was definitely excited by all the functions listed (soup, rice, multigrain, sauté, even yogurt!). But I was also intimidated. How long would it take me to figure this thing out? Would there be a steep learning curve? Had I just purchased another kitchen appliance that would collect dust? 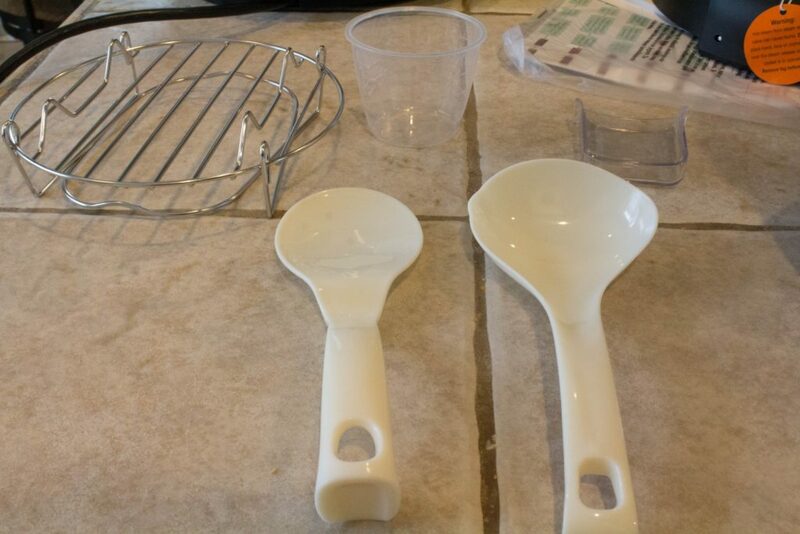 Here are some of the items that were included in the box: a trivett, water cup, and a couple of spatulas. This is the removable bowl that comes with your Instant Pot. It’s what you use to cook the food in. I love that it’s dishwasher safe! I also found a Quick Reference Guide, a User Manual, and a small Recipe Book in my box. I absolutely recommend reading through the User Manual! 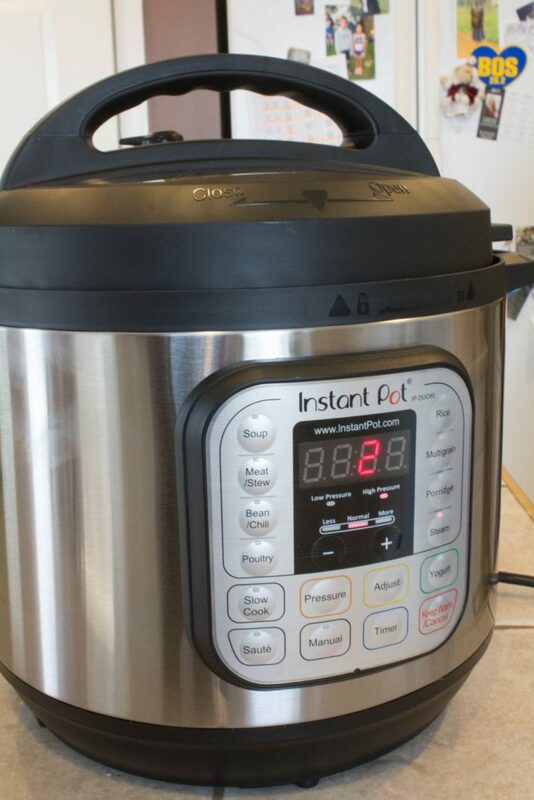 It will familiarize you with the working parts of your Instant Pot, provide some safety precautions, and give you a sense for how it works. 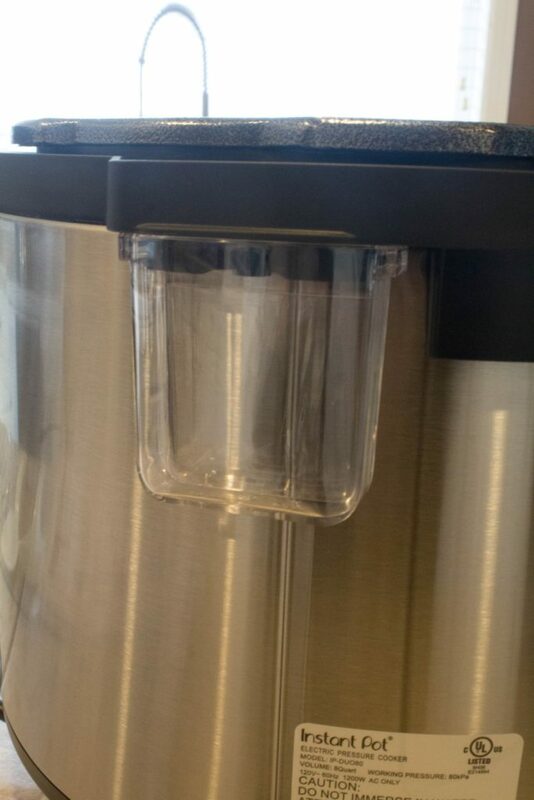 The User Manual will also direct you to add the condensation container, which clips onto the side. I followed this short 2-minute long YouTube video on how to do the water test. You basically throw in a couple cups of water, bring it to pressure, and release the pressure. Pretty simple and the entire thing took about 10 minutes. One of the things I was concerned about was the potential to have it explode or scald me. After doing the water test, I’m definitely less concerned about this! 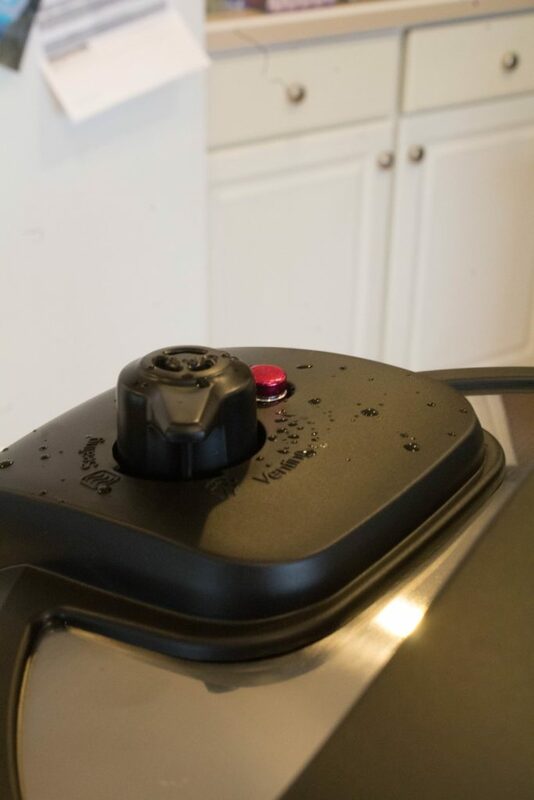 When bringing the Instant Pot up to pressure, you move the valve to “sealing.” When the food is cooked, you either use a natural method of release (where you basically just let it sit for awhile) OR quick release, where you move the valve to “venting.” Either way, you’ll know it’s safe to open when the float valve has dropped. 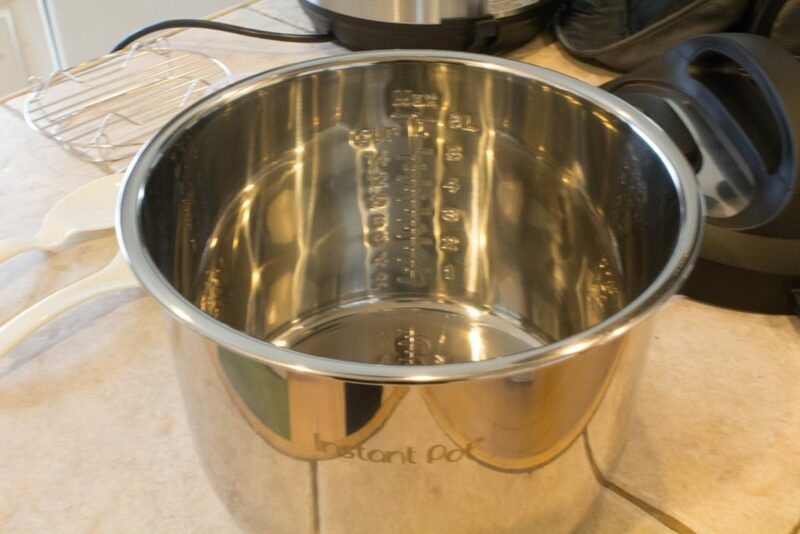 There are a number of safety precautions built in, and I found that I was very quickly at ease with using my Instant Pot. 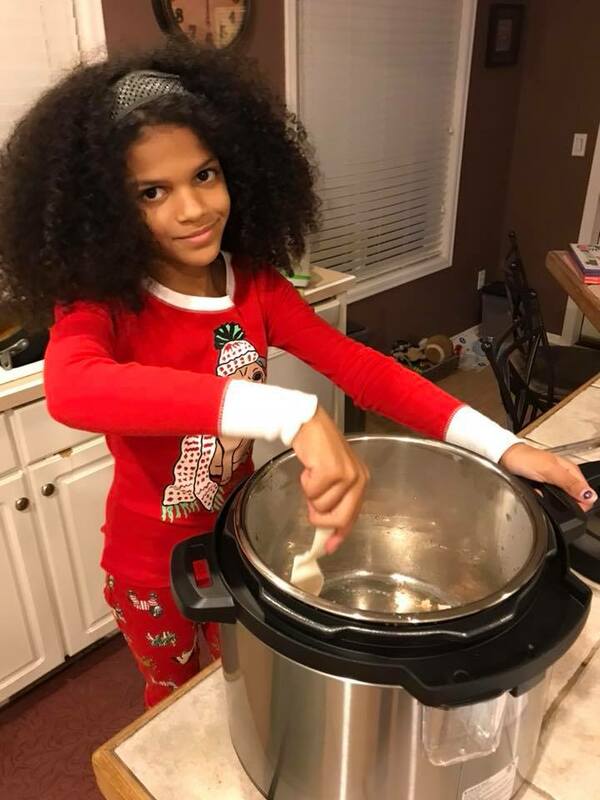 I decided to let my daughter choose our first Instant Pot recipe. 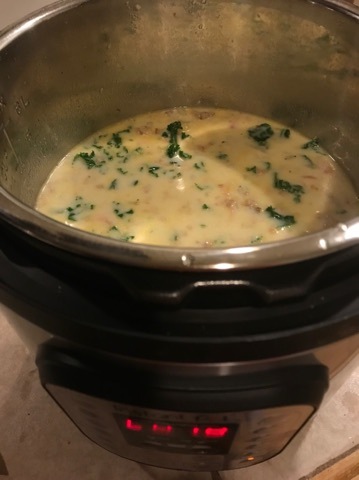 She chose a Zuppa Toscana recipe that was strikingly similar to one we make on the stove. I thought it would be a good idea to see how much faster/easier cooking in the Instant Pot might be. Here’s what I learned: it’s not exactly “instant.” Truth be told, the recipe took approximately the same amount of time in the Instant Pot as it does over the stove. We still had to sauté the onions and garlic, fry up the bacon, and brown the sausage. I assumed you just threw everything in the Pot and it did its magic. While this may be the case for some recipes, it’s certainly not the case for all. Second, one thing a lot of people fail to mention is that it can take quite awhile to bring the Instant Pot to pressure. According to my user manual, this can take anywhere from 10-40 minutes depending on the type, temperature, and volume of ingredients. So when someone says “it only took 10 minutes in my Instant Pot!” they are kind of giving you a half-truth. Sure, our soup took 7 minutes to cook, but it also took about 20 minutes to come up to pressure. And then we had to wait another 10 minutes for the pressure to release before I could open the pot. If you’re doing the math, that’s more like 35+ minutes than 7 minutes. Still, once your ingredients are cooking, it’s definitely a LOT less fussy than monitoring a pot of soup boiling away on the stove. It really is hands off, which I like. And the soup? It turned out delicious and was definitely easy to make! I don’t have a picture, but I also ended up making steel cut oats for breakfast, with apples, butter, and cinnamon. It was amazing! Again, the whole process took closer to 30 minutes when you account for bringing up and down in pressure, but the result was much better than any steel cut oats I’ve made on the stove. For that reason alone, this will be my go-to method for cooking steel cut oats now. Here is what I’m thinking about the Instant Pot so far, to sum up. It’s not at all tricky or difficult to use. 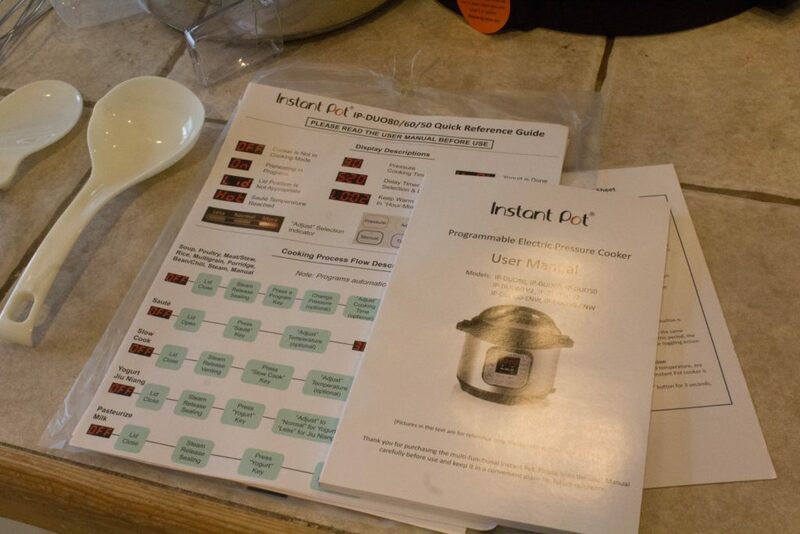 I’d say, give yourself a good hour to read the manual, do the water test, and familiarize yourself with your Instant Pot. I truly think at that point, you’ll feel comfy to try your first recipe. It’s not exactly “Instant.” As stated above, I don’t think it’s fair that many people have understated the amount of time it takes to cook things. While the machine rocks, I think you should have a fairer expectation of the time involved to prep and cook your meals. I’m glad I bought it! It absolutely seems like a useful appliance and the fact I’ve already used it twice in three days (with good results, both times) is promising. I suspect the method of cooking will enhance the flavors of certain dishes and may yield better results for certain items that can be trickier or time consuming to cook on the stove, such as dried legumes. All in all? 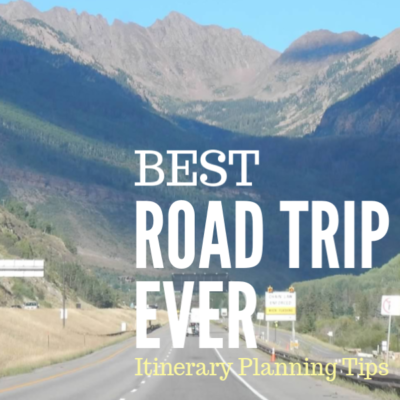 It’s a win and I recommend it! 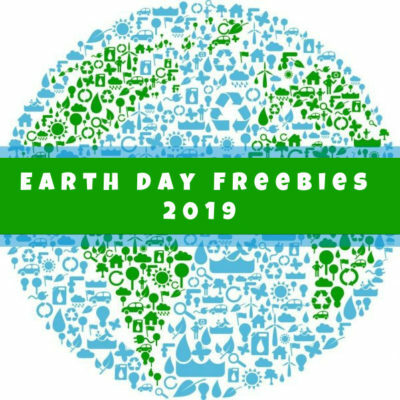 Are you thinking maybe you’d like to have an Instant Pot, or gift one to a friend? Take a look at the one I bought on Amazon. You’ll see it’s well-rated after thousands and thousands of customer reviews! I also recommend picking up a couple Instant Pot recipe books (Amazon link). While it’s fun to browse the Internet and Pinterest, I also found it helpful to have an actual book I can thumb through. Both recipes I made come from books I picked up on Amazon. 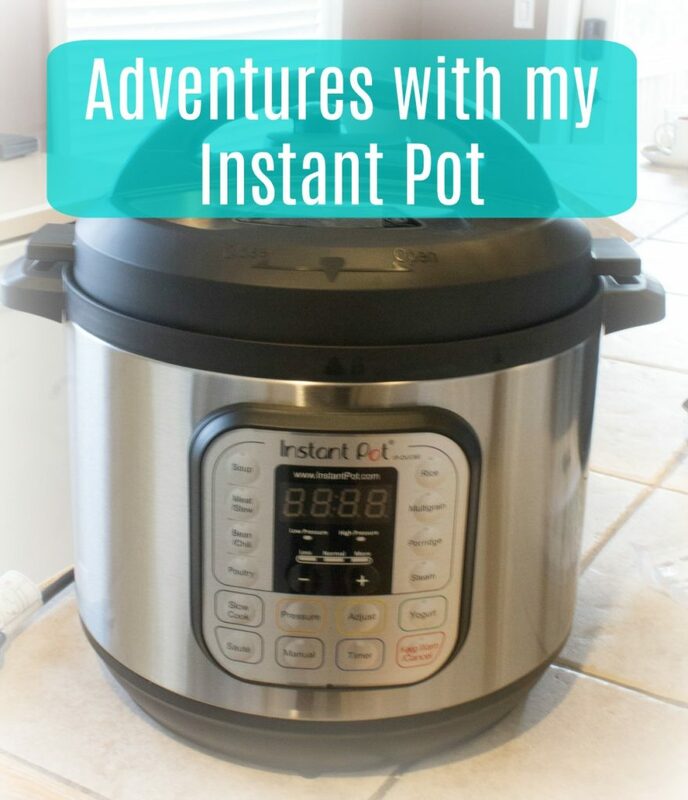 I’d love to hear your thoughts and experiences with the Instant Pot! Did you just buy one and if so, how is that going? Are you thinking of buying one? thank you for your candid review. I just bought one and am excited to start using it. How do you like your size (8qt?) I haven’t used it yet because I am waiting to see if there’s gonna be a screaming sale on the larger one. Truth be told, the 6 qt probably is sufficient for my everyday needs, but I’ve heard people cook hams and roasts in there. If you do, please discuss approx weight of your roast and if there’s room to spare. thanks! I have an electric pressure cooker that I bought off of qvc a couple of years ago. I do agree that the pressure time coming up/down is misleading when the cooking time is mentioned. However, I use it to make soup every week that my husband and I eat for lunch every weekday. You do still have to sauté all the ingredients but I find not having to watch over the pot on the stove so much more convenient. I just set it and forget it. I have done some pork loin roasts as well nad they have come out real well. Love this post. Thanks for sharing your experience. 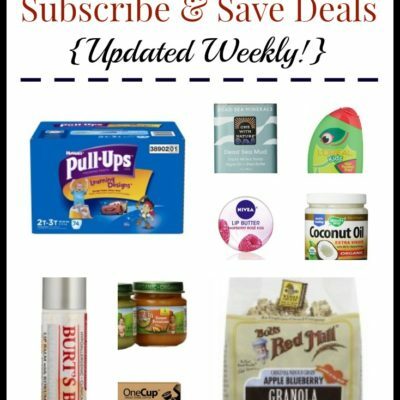 I don’t have an instant pot and I would be interested in hearing in another month if your use it as much as you thought you might. Seems like it could go either way – something to use a lot, or something that ends up collecting dust. My mom bought me he same one for Christmas but gave it to me early. Was a little nervous about it once I got it out of the box, but after making a pretty quick bbq chicken meal for the fam in way less time…I’m sold! I also steamed some veg for my baby and today I’m making applesauce.